Germany’s answer to JK Rowling, novelist Cornelia Funke hasn’t had the best start when it comes to the adaptation of her various franchises for film. The expensive Inkheart failed to inspire a trilogy in 2008, and the abundance of international co-production partners in the credits of Ghosthunters doesn’t inspire confidence. Yet by aiming no higher than a Harry Potter clone, the resulting product turns out to be competently made and likeably brisk. Pitched squarely at pre-teens, writer-director Tobi Baumann’s spooky adventure story follows an anxious boy called Tom (the talented Milo Parker from Mr Holmes) with a mortal fear of the supernatural. 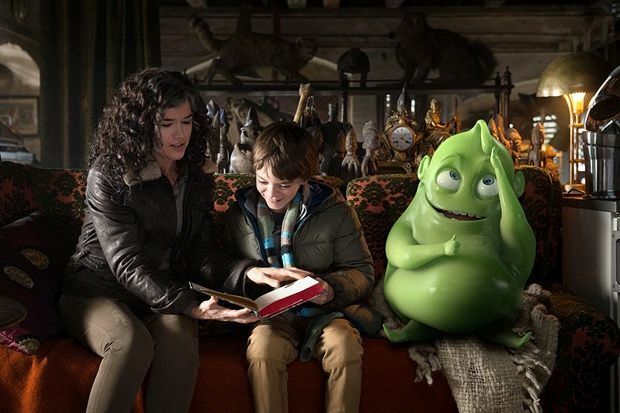 He falls under the wing of Hetty Cuminseed (Anke Engelke) – a world-weary paranormal expert recently laid off by the officious Central Ghosthunting Institute – and develops an unlikely friendship with a green ghost called Hugo (voiced by Bastian Pastewka), a cross between Slimer from Ghostbusters and Oh, the jolly alien from the recent animated hit Home. Together, Tom, Hetty and Hugo defy the institute to track down an ancient ice ghost, whose powers threaten to freeze the world if the ghosthunting team don’t move quickly. Unfortunately Hugo is the kind of lifeless special effect that gives computer-generated imagery a bad name. But Baumann’s casting of Parker and particularly Engelke comes up trumps; sour of disposition and dismissive of Tom’s help, Hetty is an amusingly against-the-grain character in a film that suffers from too much crowd-pleasing cheeriness. Some nice gags, like the use of a burger bar drive-through as an entry to a secret complex, are well handled, and the climactic confrontation with the ice monster has an epic scale. Ghosthunters effectively nails down what an audience of 8 to 12-year-olds might enjoy: silly scares, simple humour and a familiar story, decently enough told. Selected release from Fri 2 Oct.